If you need to develop better sleep habits, get up too early, stay up too late or work too hard during the day, you may want to consider a daily dose of power nap for energy. A power nap will help to rejuvenate the eyes and the whole body for increased work production and improved memory throughout the day without needing a full night's sleep. According to a recent study on napping from the University of California - Berkeley, results showed improvement in short term memory, increased stamina and energy, increased learning capacity of the brain and reduced sluggishness by those that took a power nap daily. At every age, learning to nap could markedly improve your overall health so follow these tips on getting the break and rest you need and get started today! Planning on when to take a nap is important as you may want to use a lunch break to squeeze in at least 20 minutes of rest time. Figure out what time your body starts to feel sluggish, your eyes get tired, your body starts to feel weak and you begin to yawn and to lose energy. These are signs that you could benefit from a quick and restful nap now. Find a quiet area in your home or office, a park, overlooking a lake, hammock or other area that you will be undisturbed that is comfortable. Set a clock if you're just getting into a new habit of starting to nap. You want to catch a few z's for 20 minutes to less than 45 minutes to obtain maximum benefits of this rest without falling into deep REM sleep, otherwise you will wake up feeling worse than before your nap. If you have good mind control, you'll be able to tell your mind exactly what time to wake up - this does takes some practice but you can do it! Close your eyes and focus on your breathing. Concentrate for a few moments only on the in and out breaths that you take to help you clear your mind and enable the body to slowly drift off and fall asleep. Using the alarm clock that you've set, your ipod to wake to music or your own mind control to wake, slowly open your eyes and take some deep breaths while still resting. Ease your body into waking by taking a few stretches while you are still in your power nap position. Slowly lift up, taking several more deep breaths to increase oxygen to the body and mind. Do a few stretches to lenghten the muscles. You should feel well rested after a proper power nap. Allow yourself to power nap daily if you notice yourself feeling sluggish, eyes tired, eyes sore or you lack energy or start yawning. Getting into a habit of taking a power nap does a body good and you will increase your learning ability, improve memory, increase energy and stamina to make it through the day. Don't forget your essential oils! Cheers! I'm off to take a power nap!! 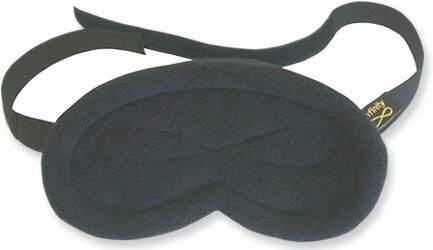 This eye mask will block out all the light to help you catch a quick and much needed rest any time of day. Keep it handy in your lunch bag, purse or car so you'll rest better.